In 1922, a geologist and paleontologist from Danville named William Gurley commemorated his late mother with a major gift to the Art Institute of Chicago—about 4,000 drawings from his private collection; Gurley, the director of the Illinois State Museum, a natural history museum in Springfield, loved European art but could afford only prints when he began collecting. When he died, in 1943, his wife gave the rest of his stash, some 2,000 more pieces, to the museum, which found it difficult to assess immediately due to its sheer volume. It wasn’t until the 1980s that curators began thoroughly cataloging the donations—and found a rare sketch by Raphael (see number 5 on the following page), one of only a few works by the Renaissance genius then known to exist in the United States. The Art Institute ranks with New York’s Metropolitan Museum of Art as having the most diverse prints-and-drawings collections outside of Europe, where the top museums—notably the Louvre, the Prado, and the Uffizi Gallery in Florence—own most of the world’s best examples of the arts. Albrecht Dürer was one of the first great printmakers, and the Art Institute has a set of his master prints. Produced in 1513 and 1514, three remarkably detailed prints—Knight, Death, and the Devil; St. Jerome in His Study; and Melencolia I—are considered the peak of the German artist’s work. The collection also comprises a wide range of works by Rembrandt, including his late religious prints such as The Supper at Emmaus; The Descent from the Cross; The Entombment; and Presentation at the Temple. Francisco Goya, the prolific Spanish painter and printmaker, narrowly avoided the Inquisition after making Los Caprichos, a set of 80 engravings, many of which bitterly mocked the church and the monarchy, and satirized the foibles of Spanish society. The Art Institute has a rare set of etchings that predates the first printed edition. Requesting works to view can be intimidating—after all, where does one start? But curator Suzanne McCullagh recommends that novices relax and take an exploratory approach. “If you don’t have any sense of what you want to see, grab a great name and ask for it—you’ll find that usually we have it,” she says, adding that you can also narrow the field by subject matter or zero in on a particular medium (such as pastel, ink, or charcoal). When asked to pick her favorites, McCullagh chose eight pieces by some of art history’s most impressive names, spanning nearly six centuries. 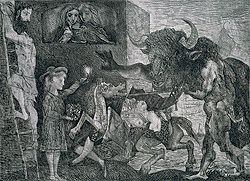 One of just two works from the 20th century that McCullagh included among her selections, this etching by Picasso is the best and most widely known of his many Minotaur studies. This impression is the final proof before the published version. Dürer, the famous German painter and mathematician, was among the first to elevate woodblock printing as a tool for creating art. This small ink sketch is noteworthy for how realistically he drew the emaciated bull, at a time when such detail was still unusual. Possessing the haphazard look of a Pollock painting, this drawing is actually rendered in ink—green, black, and bright purple—to achieve a calligraphic quality. This pen-and-brown-ink work came from a sketchbook, most of which now sits in the Louvre. A closer look also reveals a distinctive bull’s-head watermark that helped date the work. Probably a study for a portrait of Saint Peter found in the Vatican, this chalk drawing of a hand is on a short list of Raphael’s last known drawings before his death in 1520 on his 37th birthday. Degas depicts the scene of a crowded concert in brightly colored pastels. The complicated tableau includes details like the man in the center about to spill his beer and a singer visibly warm from the stage lighting. Rembrandt’s Crucifixion scene went through five versions. In the final, the artist covers some of the figures on the sides with an etching technique called dry point, obscuring them and creating a sense of chaos. Watteau was a French painter known for a light-hearted style that helped inspire the Rococo movement. The Art Institute has several of his drawings, including this example, a dignified chalk portrait of a Savoy street performer lugging his marmot box.